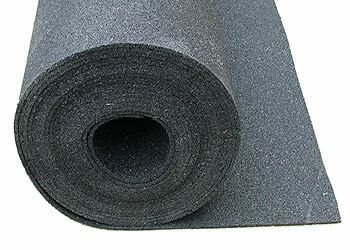 Linoroll is recycled resilient rubber underlay for use beneath lino or vinyl to help absorb impact noise. Designed to be used with our thin MDF tongue and groove flooring between the underlay and floor covering to give stability. My neighbour downstairs was complaining about noise from my flat. It had been an ongoing problem. A timber floor had been laid badly on top of the existing ply. It creaked, the ply creaked and the impact noise of anything dropped on the floor could be heard through the 150mm concrete slab below, waking up the occupant below. The boards were taken up, the ply re-screwed, a layer of linoroll5 laid above, topped with lino. Problem solved. That was three years ago and there have been no complaints since. The Linoroll5 was easy to lay. We have a policy commitment to sustainable materials in the block, so we were very pleased this could all be done with recycled rubber and without having to resort to carpeting. A 5mm thick recycled rubber acoustic underlay for vinyl and lino floors designed to reduce impact noise transmission through the floor. Ensure all floorboards are suitably fixed so as not to squeak when walked on by fixing with screws everywhere movement is found. Then seal all joints and edges of the floor with our flexible, high density Acoustic Sealant to ensure floor is airtight. Fit the Linoroll wall to wall and glue down using a latex adhesive. All joints should be tightly butted with no overlapping. Once fitted, overlay with our waterproof 6mm MDF tongue and groove floorboard with all joints glued and also glued to the underlay. Once the adhesive has set, install your preferred floor covering as normal onto the MDF. Lift the floorboards and loosely infill between the joists with 100mm of AMW100 acoustic mineral wool then refit the floorboards and screw down so as not to squeak when walked on. As already mentioned, then seal with our Acoustic Sealant. For even better results, use our SoundBlocker Quilt instead of the more normal acoustic mineral wool. To help reduce airborne noise transmission through the floor you need to add mass to the floor and the best way to do this is to overlay the floor with several layers of our sound barrier mat and either glue down with our Sta-Stuk aerosol contact adhesive. The rest of the installation should be carried out as described above.